Leading Manufacturer of jar washing machine from Ahmedabad. Our company has been acknowledged in offering Jar Washing Machine to the clients. Jar Washing Machine is manufactured by using utmost quality raw material and advanced technology at production unit. Offered range is extensively used by a number of industries for fast and efficient washing. This product is available in different shapes and sizes to meet the diverse industry requirements. Offered range is stringently testified by our quality inspectors on various quality parameters to ensure best quality product delivery to prestigious patrons. Jar Washing Machine offered feature use of quality tested as well as high performance working components and parts that assure of the reliable working performance of jar washing machines. Here, we can offer the system in different functional capacities to choose from. 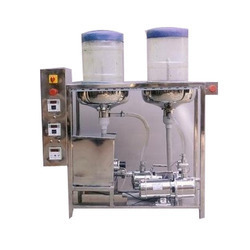 Some of its features include provide for automatic working support; suitable for use in liquid packaging line for food, beverages and other industry sectors; allows support for better and faster production cycle; high efficiency based working; PLC controller with touch screen support for easier operation handling. Looking for Jar Washing Machine ?